J&J Vinyl Fence excels at installing privacy vinyl fences and gates of unparalleled craftsmanship at competitive rates for residential and commercial clients. We have over 35 years of industry experience and during that time we've custom designed and built thousands of beautiful and long-lasting vinyl fences throughout Los Angeles County. These solid board vinyl fences not only provide privacy and security, but also enhance homes or businesses and last for decades. With a variety of color choices and post-cap options, our privacy vinyl fences can be customized to perfectly complement your property. We can paint your fence white or tan, and apply a wood-grain finish for a more natural wood-like appearance. We also offer multiple post-cap options, such as pyramid, gothic, solar-powered lighting, New England, federation, and ball post. In constructing your fence, we'll position it so that it's perfectly symmetrical with its conjoining parts, hand-cutting each part so that the tops are completely smooth all the way across, with post-caps firmly locked into the overall railings and foundations of the fence. Your completed fence will have an airtight design that allows for unbeatable durability and wind-resistance. Additionally, all of our privacy vinyl fences are built using premium-grade vinyl with SolarGuard paint, which protects your fence against fading, peeling, flaking and blistering. 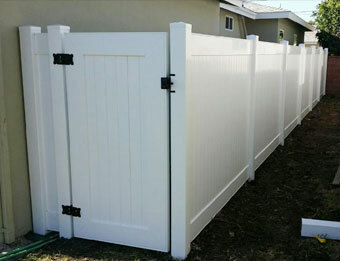 At J&J Vinyl Fence we're committed to providing Los Angeles County's best value for privacy vinyl fences. Our privacy vinyl fences are virtually maintenance free and come with a limited lifetime warranty. Call today for a free estimate. We're licensed, bonded and insured and offer all new clients a 10% discount. We welcome vinyl fence installations throughout all of Los Angeles County, including in and near Beverly Hills, Palos Verdes, Torrance, Sherman Oaks, Redondo Beach, Los Angeles, Long Beach, Inglewood, and Hawthorne.